In related news, the U.S. Army Corps of Engineers is now accepting public comments on Line 3 water crossing permits, according to an MPR story. Line 3’s approved route “requires crossing more than 200 bodies of water, including roughly 100 ditches and three rivers the Corps considers ‘navigable waters. '” The comment period closes Jan. 21. Here is the direct link to make your public comments. Enbridge also has applied to the Minnesota Pollution Control Agency (MPCA) for separate water crossing permits in according with state clean water laws. The MPCA has not announced the timing or the public comment process for those permits; they are expected in early 2019. This is another important opportunity to stop Line 3 based on its numerous water crossings and spill risks. 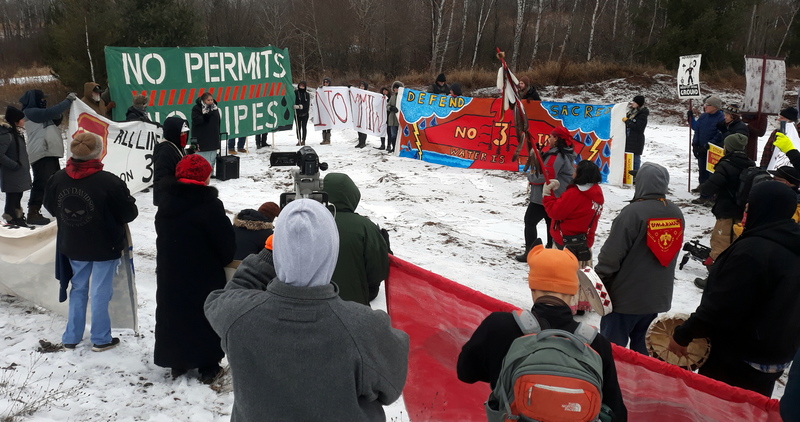 A rally at one of Enbirdge’s pipeline storage yards Thursday. A major question moving forward is: How much construction and pre-construction activity will the state and the courts allow Enbridge as court cases and permits are still pending? Line 3 opponents are expected to ask the courts to impose an injunction on pipeline work until appeals are resolved. Gov.-elect Walz and his agencies could have a say in the matter, too. At the request of the Ginew Collective, 50-60 people gathered at a pipeline storage yard in a Carlton County gravel pit Thursday to oppose any Line 3 work all project reviews are complete. The Ginew Collective is “a grassroots, frontlines effort led by indigenous women to protect Anishinaabe territory from the destruction of Enbridge’s Line 3 oil pipeline,” according to its Facebook Page. People from across the state attended Thursday’s rally. It is the kind of event that will become increasingly frequent if Enbridge starts pipeline work, such as cutting trees or digging trenches. Participants carried banners such as “No Permits, No Pipes,” “Protect Our Wild Rice” and “Stop All Line 3 Construction.” Speakers talked about everything from climate destruction to the pipeline’s impact on local communities, such as the link between construction camps and Missing and Murdered Indigenous Women. Police arrived to evict people from the property; two were arrested. 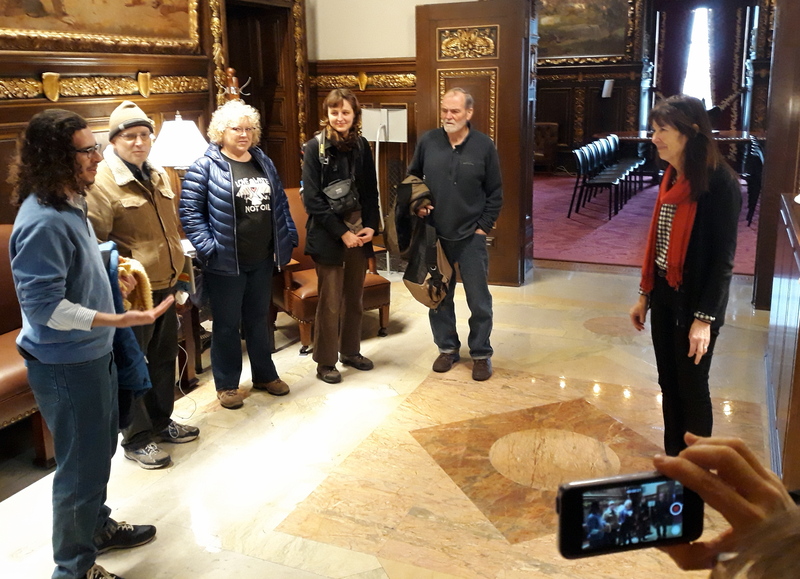 The Minnesota Department of Commerce’s decision to appeal the PUC’s Line 3 approval sends a powerful message that not only do indigenous and environmental groups oppose Line 3, but even a key state agency thinks it’s a bad idea. Friends of the Headwaters also has filed an appeal. The Red Lake Band of Chippewa Indians, the White Earth Band of Ojibwe, Honor the Earth and the Sierra Club filed a joint appeal. And the Youth Climate Intervenors are expected to file an appeal, too. At their most basic, these appeals say the PUC’s decision approving Line 3 was contrary to the law, not supported by substantial evidence and was arbitrary and capricious. The PUC failed to consider future oil demand, as required by law. For instance, Friends of the Headwaters says both the state Department of Commerce and the Administrative Law Judge who issued an independent recommendation on Line 3 concluded, “there is no demonstrated demand for the oil, certainly not in Minnesota or the Midwest. All domestic refineries that might be served are already securing all the crude they need to run at or near their … capacities. In fact, U.S. demand for crude oil is dropping … ” The joint appeal filed by Honor the Earth also said that the PUC failed to consider the impact of petroleum conservation measures on the need for Line 3 — as required by law. The PUC failed to look at the big picture: The joint appeal said Enbridge plans to expand several of its existing pipelines that together would provide more capacity than the proposed new Line 3. The PUC refused to look at the cumulative effect of all of Enbridge’s proposed upgrades. By failing to do so, the PUC violated state law. The climate disaster risks are unacceptable: According to the Friends of the Headwaters appeal: “the climate impacts of a new transportation capacity facilitating additional tar sands production, measured against the federal social cost of carbon, dwarf any conceivable benefit from building the line.” The Line 3 environmental impact statement estimated Line 3’s “social cost of carbon” at $287 billion over three decades. The appeals raise the risks of oil spills in the state’s cleanest waters. The list goes on. The bottom line: Line 3 is far from a done deal. The opposition is only getting stronger.